A Pennsylvania Massacre: What Happened at Duffy’s Cut? In their new book Massacre at Duffy’s Cut: Tragedy & Conspiracy on the Pennsylvanian Railroad, Bill and Frank Watson explore the tragic deaths of 57 railroad workers near Philadelphia. They decided to share with us some of their reasons for writing about the little-known incident, and why they think so many innocent men may have lost their lives the summer of 1832. There is a sense in which our book, Massacre at Duffy's Cut, has been 186 years in the making. Since August of 1832 there have been those who, despite others who tried to bury the story of Duffy's Cut, have faithfully remembered the sacrifices of those who were massacred at mile 59 along the old Philadelphia and Columbia Railroad. Among other things, this book chronicles those who transmitted the Duffy's Cut story through all those 186 years. The book offers details not only of the railroad cover-up of the deaths at Duffy's Cut, but also of the transmission of the Duffy's Cut narrative within the Irish-American railroading community. In this book we have sought to present the stories of those who made the memory of Duffy's Cut possible. When we started our investigation at Duffy's Cut, we had an indication that violence was present at the site from the archival records. We had no idea of the level of violence that we would discover there -- until we found bullets mixed in the remains of the shanty area were the Irish laborers were living in the summer of 1832. And then -- once we had found the remains of the workers -- we discovered that everyone buried there had been murdered, including one man who was both axed in the head and then shot in the head. When the remains of this man was re-interred we buried him with the bullet still in his skull -- a silent witness to the bigotry and vigilante violence that killed 56 innocent men and at least one woman at Duffy's Cut. The motives for murdering immigrant laborers in the midst of a cholera epidemic stemmed from ignorance of how the disease is spread, to scapegoating immigrants for bringing cholera, or hatred born from nativism. But the cover up of the story has even larger motives: For the railroad and for Philip Duffy, what happened at Duffy’s Cut would have hindered the recruitment of inexpensive Irish laborers in the future. For the local homeowners who were involved in the East Whiteland Horse Company, the story certainly would have tarnished the reputations of a good many individuals involved in the violence and in the cover up. We know that key sources that recorded details of the murders, such as newspaper reports and diaries, were removed from the record deliberately because they would have implicated local individuals in the murders. While the sources are clear that cholera did spread into the railroaders' camp prior to the murders, the question of whether violence or death by cholera claimed most of the workers remains to be fully answered. So far, we have uncovered seven sets of remains, all of which show signs of murder by blunt force trauma and gunshot. This evidence points to a massacre. However, if future excavations reveal that all or most of the deaths at Duffy's Cut were caused by violent perimortem blows and by gunshot, then Duffy's Cut might constitute the worst mass murder in the history of Pennsylvania. We know of the existence of two other local sites in Chester County where Irish immigrant laborers died under similar circumstances in the cholera epidemic of the 1830s and 1840s—a railroad site in Downingtown (connected to Duffy’s Cut), and a canal construction site in Spring City. This could be the tip of the iceberg of Irish immigrant laborer deaths at industrial sites throughout America. We know that perhaps 20,000 Irish laborers died constructing canals and rail lines across the East Coast in the 1820s and 1830s and most of these anonymous victims are buried in mass graves stretching from the Erie Canal in New York to the New Orleans Canal in Louisiana. How many of these workers died from disease and neglect, and how many died from from violence, may never be known. But at least in the case of the workers at Duffy's Cut, we have part of that answer now, and we present the beginning of that answer to you here. Irish-born railroad contractor Philip Duffy, whose name has inextricably been linked with the deaths of fifty-seven fellow Irish immigrant laborers in August 1832 at the place known as Duffy’s Cut, has been styled an “immigrant who succeeded against the odds.” Over the years, Duffy worked his way up the business and social ladder from an immigrant laborer to a respected railroad contractor. Before his death, his occupation was listed as a “gentleman” within the city of Philadelphia. Philip Duffy was born in Ireland in 1783, the year the Treaty of Paris ended the American Revolution. Fifteen years later, in 1798, as Ireland witnessed the United Irishmen Rebellion, the fifteen-year-old Duffy joined many of his compatriots and fled Ireland for a new life in America. Duffy settled in Philadelphia County, where Duffy and his family spent most of their lives, outside of his sojourns as a railroad contractor in different parts of the state of Pennsylvania. 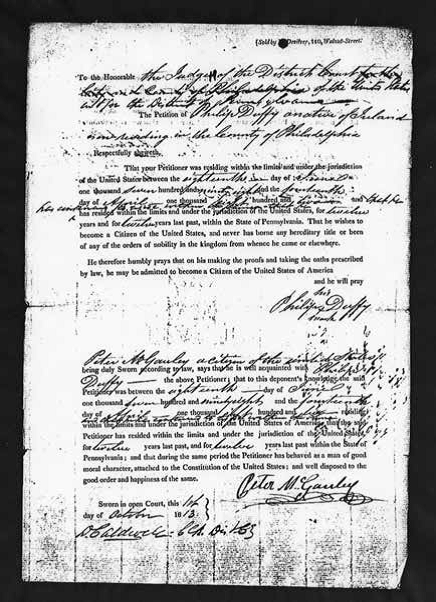 In 1813, with Great Britain at war with his adopted country, Duffy filed his petition for naturalization. When Duffy became a citizen of the United States, he was thirty years old. Between his arrival in 1798 and the later 1820s, Duffy moved up from working as a laborer to become a contractor who hired and supervised other laborers on public works projects. Duffy’s rise to the position of contractor coincided with the dawn of the railroad age in the United States. The first known railroad contract on which Duffy is named as a contractor dates from February 1829, where he is listed as “partner” with his brother-in-law, and fellow Irish immigrant, James Smith on “section 16” of the Philadelphia and Columbia Railroad (P&C) . Duffy was successful enough on that mile of the P&C that in June 1829, Duffy received his own contract to work on mile 60 of the rail line. Newspaper accounts reported that Duffy used Irish immigrant laborers for that work, which was a practice that Duffy would continue throughout his career on the railroad. The work crew that Duffy used at mile 60 was described as “a sturdy looking band of the sons of Erin.” Some of Duffy’s Irish immigrant laborers even lived with him at times. The work along mile 60 was described as “Herculean,” as Duffy’s laborers built a very difficult roadbed for the railroad. With mile 60 of the P&C, Duffy made a name for himself as a hardworking contractor who was able to prosecute difficult work in a relatively short period of time. This became the pattern for the rest of Duffy’s life, as he worked for the railroad and, later, for the City of Philadelphia. 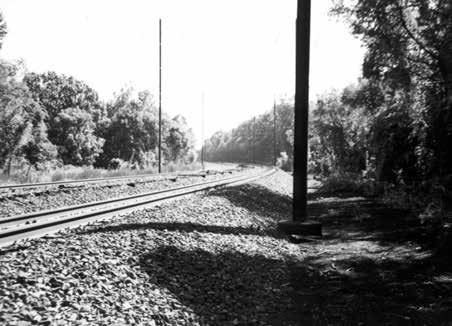 Eleven months after he began work on mile 60, Duffy was given a contract for what became the most expensive, the most difficult and the most dangerous mile of railroad on the whole line of the P&C, the mile that would come to be known as Duffy’s Cut.